Yes, EOS is still a blockchain. But its leadership seems more interested in practicality than decentralization. The recent decision by an EOS arbitrator, Ben Gates, to intervene in a dispute over stolen keys calls into question whether EOS is on board with the fundamental tenets of blockchain technology. Last month, an EOS account owner claimed to have been the victim of a phishing attack, leading the owner's private keys to be stolen and their account to be used without their consent, presumably to send tokens to the phisher's own account. 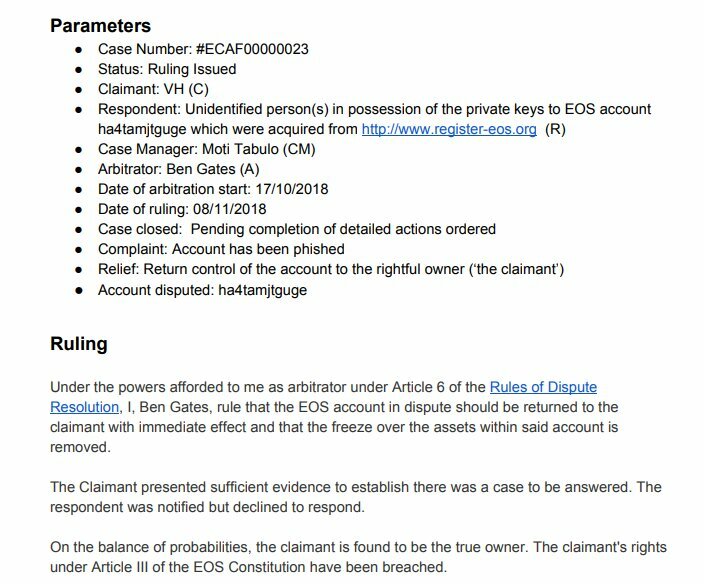 "Under the powers afforded to me as arbitrator under Article 6 of the Rules of Dispute Resolution, I, Ben Gates, rule that the EOS account in dispute should be returned to the claimant with immediate effect and that the freeze over the assets within said account is removed. "The claimant presented sufficient evidence to establish there was a case to be answered. The respondent was notified but declined to respond. "On the balance of probabilities, the claimant is found to be the true owner. The claimant's rights under Article III of the EOS Constitution have been breached." Article III states that "no property shall change hands except with the consent of the owner." It's unclear how exactly the EOSIO Core Arbitration Forum (ECAF) plans to make the user whole, but it's extremely unlikely they'll be rolling back the whole blockchain. Phew, it's still immutable. Instead, it will likely be transferring the funds to a new address for the owner. Thus, while EOS may not be breaking blockchain's promise of immutability, the network is shattering another core tenet of blockchain – decentralization. The reaction to the decision on social media was decidedly negative. Crypto lawyer Stephen Palley wryly said on Twitter: "Default judgements. You invented default judgments." In this line of thinking, EOS' chosen governance mechanisms are merely recreations of existing governance systems, which are themselves centralized. The fact that EOS decision makers can send money back undercuts the peer-to-peer nature of the system; we're back to having guardians to trust. To give EOS credit, however, its constitution and arbitration procedures seem to be a response to failed cryptocurrency experiments of the past. The DAO hack and subsequent draining of accounts led to handwringing in the Ethereum community. While most stakeholders were on board for the subsequent rewinding of the Ethereum blockchain so that it was like the hack never happened, many weren't. That's why we have Ethereum Classic. Still, despite the reaction to the DAO hack, the Ethereum community has more or less accepted that individuals will occasionally have their crypto stolen; it's part of the tradeoff of a decentralized network. Rather than see the EOS network become a bastion of crime, EOS creator Dan Larimer and others tried to institute a system that installed trusted good guys. (Theoretically, anyone in the EOS community who meets the base requirements can become an ECAF arbitrator, but the mechanisms of top-down power are still at play.) This approach eliminated the need for vigilantism. People would be policing the network. But this approach fundamentally de-emphasizes decentralization. "EOS is taking a new approach to solving the problems with centralized governments that doesn't throw the baby out with the bathwater. In this case, the baby is civilized dispute resolution among consenting adults along with the broader concept of peer to peer community enforced contracting." EOS' setup may garner some shade from blockchain insiders, but it's conceivable that it's more marketable – the public has little use for idealism over practicality. It's certainly easier for newbies to get onboard with blockchain if they're not constantly worried they'll lose all their money – or, rather, all their EOS tokens. Lost your private key for your holdings in Ethereum? You now have no funds. Lost it in EOS? Don't worry – we'll help you get it back. EOS, then, favors incrementalism over idealism, keeping some key components of blockchain technology without going maximalist on any of them. Maybe call it blockchain lite. Correction (11/13/2018): An earlier version of this article incorrectly implied that the ruling literally reversed transactions. Like what you read? Follow us on Twitter @ETHNews_ to receive the latest EOS, ECAF or other Ethereum cryptocurrencies and tokens news.